Have you ever stopped to take a picture of wind turbines stretched across rolling hills? Or, seen Harrison Ford diving into the rushing waters of North Carolina’s Cheoah Dam in The Fugitive? What about James Bond’s opening jump in Golden Eye (really filmed at Switzerland’s Verzasca Hydro Electric Plant)? This is the exciting, even dramatic face of power generation. But it is only the beginning of the journey. Between the point where electricity is produced and where it is consumed (our homes and appliances), lies an entire electricity network, with, at every critical juncture, a substation. They might be less photogenic, but this is where connectivity really begins. Without substations, most power would never even get to the consumer. Because to cover long distances, electricity moves along power transmission lines at much higher voltages than what you need to charge your phone. Substations act as hubs, collecting and retransmitting electricity from points across the network. They’re equipped with transformers to “step-up” voltage for the long road to the consumer, or step-down voltages to enter the distribution grid. In short, substations are worth talking about. They are at the frontline of sustainability. They also keep us safe. Substations feature protective equipment like circuit breakers and sensors to prevent blackouts and make sure everything runs smoothly, all day, everyday. So, why not connect these sensors to the larger network? Why not have interconnected substations that could communicate in a mutual support system? Positioned at the heart of the grid, the potential of substations to enhance global energy connections is enormous. Utilities and governments are working hard to lower their dependency on fossil fuels, while improving the reach and reliability of their electricity networks. The International Energy Agency predicts the amount of global power generated from renewable sources will grow from 3 percent in 2009 to 38 percent in 2050. Infrastructure has to support this increase. It is a huge task, requiring targeted investments. But the global consensus seems clear: to go forward you have to get smart. Newly digitized electricity networks are now collecting actionable data from points across the grid. Channeling all of that data through software systems for real-time, comprehensive situational awareness. They are “smart” because they know how much power is available from every asset in the network (wind farms, battery storage…) and how much the consumer actually needs. Quick thinking networks, interconnected to multiple energy sources, they are better equipped to weather emergencies, even “talking” to neighboring grids to buy and sell energy. For optimal smart grid performance, every element of the network, from the meter in your home to the control room needs to be online. To get this done, legislative bodies like the European Commission have called on transmission and distribution system operators to build the infrastructure necessary for the “flow of both energy and information between consumers, generators, suppliers and all the other actors in the new smart grid framework.” This includes developing substations capable of driving efficiency and reliability. It’s not so easy when just one of our GE customers, Power Grid in India, operates over 200 substations. Several of those are brand new but, in general, the average age of an existing substation is more than 40 years old.Sure you can upgrade, but eventually, you’ll have to build new. What will the next-generation substation look like? It will be smaller, more compact and maybe, just a little bit more lonely. Call it self-sufficient, but our new digital substation will be both connected and literally, left to its own devices. It will be able to monitor its own health, fix bugs, and if needed, “heal” damaged lines by itself. The first step to a truly intelligent substation is to connect and digitize primary devices. By putting more of your critical equipment on-line, you can shrink your overall footprint by 15 percent or more. Plus, monitoring the substation status with Intelligent Electrical Devices, or IED’s, technicians can make smarter decisions. 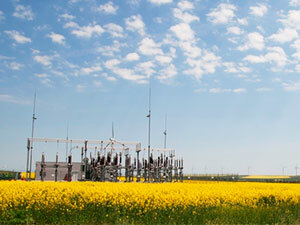 Productivity and reliability grow, improving substation performance. Once the digital structure is set up, operators can collect and analyze any kind of data. It wasn’t enough to see the data coming from the main electrical equipment; new substation automation systems can actually analyze information, in real time, not only from the primary process but from any secondary or auxiliary device in the substation. This provides greater situational awareness with mission critical protection alerting the operator to problems before they occur. Can we go even further? We already have. Where others are still connecting and digitizing, GE is moving from evolution to revolution. Our new technology can also help predict and optimize the substation status -through state estimation algorithms and software applications, allowing utility operators to maximize substation utilization and deliver a modern, more reliable and efficient grid. In fact, our vision for the substation, a digital substation will be on view at this year’s Cigré (International Council on Large Electrical Systems) event, held in Paris, August 21-26. What’s new? Meet the digital twin. Sounds like science fiction, but it’s actually a pretty neat tool to optimize operational flexibility. GE’s groundbreaking DS Agile control system uses collected data and statistic models to build a computerized model of an equipment or even the entire substation: the twin. This interactive model allows the operator to develop baselines for healthy performance, to move from reactive to predictive maintenance solutions and increase substation life. Modeling along with enhanced condition monitoring – knowing the actual state of every piece of equipment – translates into greatly improved asset performance. Digital twins are so promising, they could actually change the way networks operate. Going further, substations can share their state information with other substations, increasing visibility over an ever-wider area of the network. Inter-substation, wide area automation, is then made possible, multiplying substation awareness through their respective digital twins. The benefits include, faster reaction and shorter self-healing time, better preparation for weather events and greater overall efficiency. Today, GE is putting its digital substation technology to the test with partners like French giant transmission operator RTE. Their “Poste Intelligent” (Intelligent Substation) project aims to develop a ready-for-market, digital substation able to optimize performance while integrating more and more power from renewable and conventional sources. In March, we installed the first components (DS Agile, IEDs process bus, COSI digital instrument transformers, new generation network switches, digital switchgear control units, wide area controls…) in RTE’s Blocaux substation, in northern France. Blocaux will be the first-ever French substation to feature all these smart and wide-area functions for an outstanding operational efficiency. With so much efficiency, resiliency and sustainability at hand, you’d think the future couldn’t be more attractive. But some clever cities are finding ways to integrate substations within the urban landscape. The Denny substation project in Seattle (USA), will feature a standout architectural envelope, works of art and surrounding park. In Lyon (France), classic substation fencing has been covered by forest of bamboo. Now at GE, we might not be making designer facades for our substations (yet) but we are definitely improving lives. We’re making every connection count, with substations that work harder, run faster and think even bigger. Sign up to explore and interact with our Intelligent Digital Substation Today!